Summer is never subtle about it's arrival. It always jumps out of a forgotten corner, on some deceivingly mild Tuesday morning, and throws shorts, skirts, and dresses at my pale legs. This free-spirited, happy salad will leave you feeling just as free-spirited and happy. It's loaded with juicy grape tomatoes, salty Kalamata olives, leafy baby spinach (Popeye was onto something), and creamy feta. And unlike some pastas, orzo isn't burdened down by too much starchiness. If spring came in the form of a salad, this would be it. And spring should work with you, not against you, when it comes to preparing for her dramatic, spotlight-stealing sibling, summer. Cook the orzo pasta according to directions on package. Drain and rise with cold water. 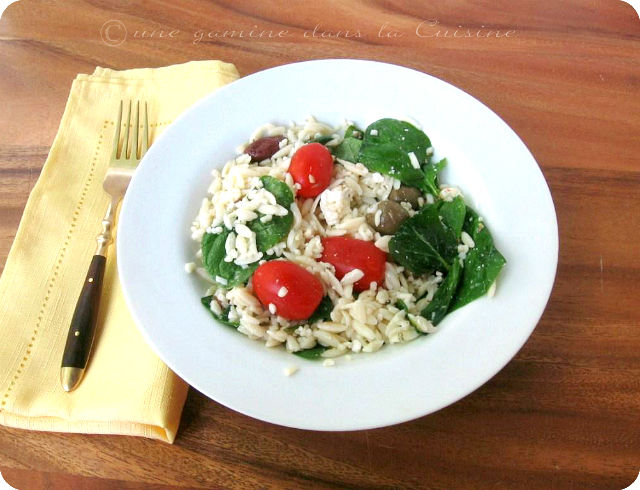 Leave the cool orzo in the colander and allow the water to drain as you prepare the dressing. In a small mixing bowl, vigorously whisk the olive oil, lemon juice, balsamic vinegar, and salt together until well combined. If not using immediately, cover and refrigerate. 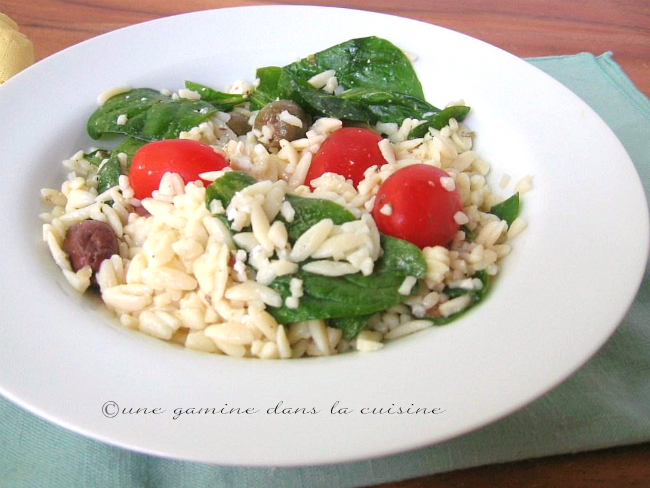 Transfer the orzo pasta to a large serving bowl. Add the spinach, feta, olives, tomatoes, and prepared dressing. Toss until everything is evenly distributed. Cover and refrigerate until ready to serve. This is my kind of salad - perfect for a light, almost summer meal! A gorgeous dish! I am a big fan of orzo. Your salad looks great! I seem to be putting feta in all my savory dishes these days. 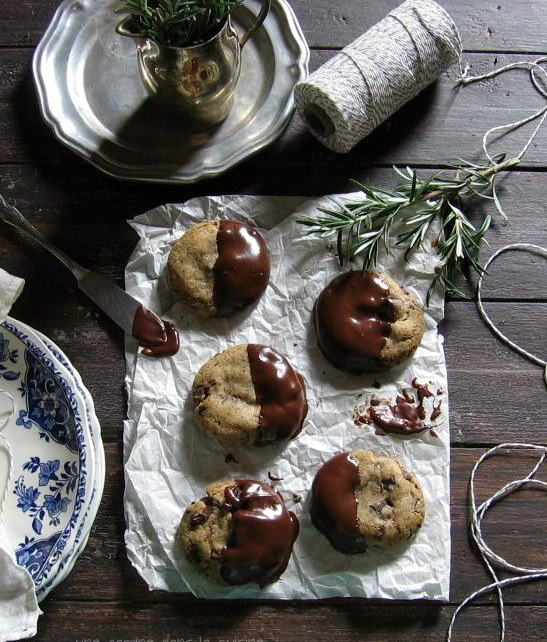 And for me, the key to baking and not gaining twenty pounds is to give most of it away too. All I really need is a sweet taste, and then I'll pass the rest along. Here in Georgia summer comes on like a tidal wave - you can see it coming a mile away and suddenly it hits and you're still stuck thinking man I wasn't ready for that! This is a salad with my name all over it. I'm 6 weeks away from a week in Las Vegas for Liv's Nationals, and I'm certain that means swim suit. I'm pushing those sugary treats away too in place of salads like these. I might even add quinoa in place of the orzo! (Though anything with orzo is a hit with me). As for summer jumping out at us... it doesn't do that here. It teases us, then it goes back behind the eternal marine layer that sits over San Diego for about 6 weeks. And yes... I get pale! :O where the sugar at?! i feel you on the pale legs - which i still manage to have despite living in southern california! that salad looks so fresh and vibrant, i definitely will be making it for lunch soon!